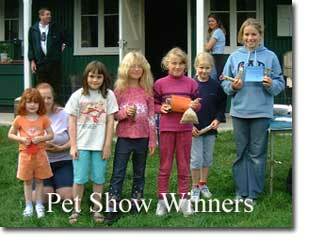 The first novelty small animal pet show in the Parish was held at Copsale Hall on Sunday, 15 September 2002. The event, which was jointly organised by The Nuthurst Society and Copsale Hall Committee, attracted twenty-nine entries including rabbits, hamsters, guinea pigs, chickens, a gerbil, a Chinese miniature hamster, an albino rat, and a leopard gecko. In addition to all the animals, there were cream teas for sale, a book stall, a raffle, and pet and animal supplies from Conies Farm, who also generously donated the prizes. Alan Turnbull, one of our local vets, ably judged the wide range of entrants for the ten classes, which ranged from 'best legs' to 'most like its owner'. Triumphing over the competition, Jennifer Potter won the coveted 'Best in Show' with her rabbit 'Zebedee' followed closely behind by Poppy Reese and her gerbil 'Belinda'. However, all the entrants were winners in their own way because they had loving and devoted owners.